All transactions are safe and secure with a reliable history in online purchasing behind each of our associates. Buy the Christmas Vacation Moose Mugs to own Christmas Vacation clothing and merchandise. 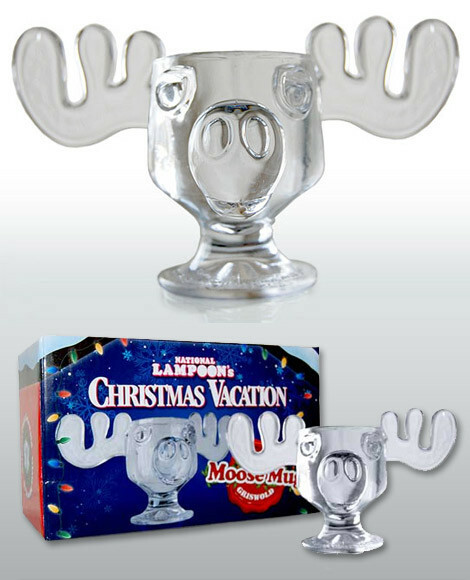 Sip your holiday eggnog from one of these great Christmas Vacation moose mugs. Clark Griswold (Chevy Chase) and his cousin Eddie (Randy Quaid) drink from moose mugs in the Christmas Vacation movie. The cute glasses are a must for fans of the movie, or for those who want to add a unique twist to their collection of holiday drinkware and decorations. The moose glasses used in the film are a tribute to the Wally World moose from the first National Lampoon's Vacation movie. The moose is the mascot of the Wally World theme park. In addition to the Christmas Vacation Moose Mugs above, browse the Christmas Vacation Clothing Gallery for more apparel like men's and women's clothes, kids shirts or hoodies.